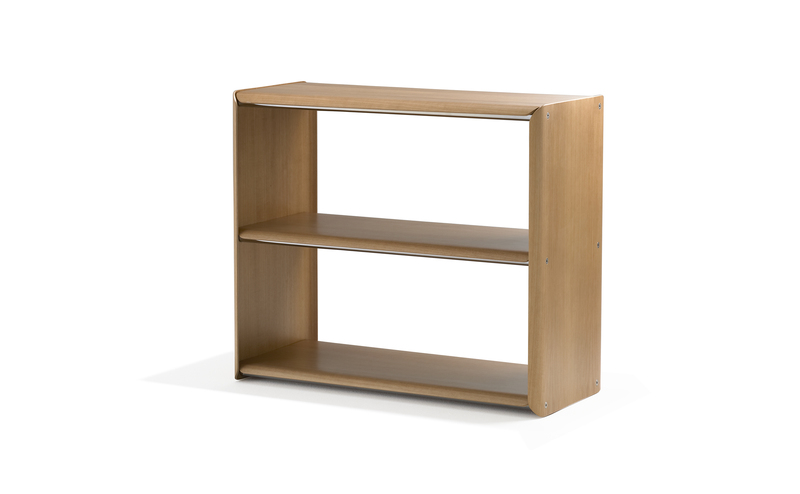 Coda is a combination of sleek molded plywood and stainless steel that form an elegant and sturdy bookcase. The slim molded plywood panels have a top veneer of satin smooth natural poplar and birch with a warm cherry tone. Combined with the panel’s rounded corners and carefully molded edge profile, the visual statement speaks to chic and minimalist design. Coda is an excellent exemplar of efficient use of materials and a limited number of parts, weighing a mere 30 pounds and shipping in a flat-packed box. With Coda, lightweight mobility compliments the durability needed to house everything from oversized books and desktop printers to delicate decorative pieces.